Our family grabbed our Visit Salt Lake Connect Passes and on the way up to Salt Lake let our two daughters pick out where they wanted to go. Of course the first thing out of their mouths was, "The Children&apos;s Museum!" which is what they call Discovery Gateway. I know that they could spend the whole day in that wonderland if we had the time. It is after all over 60,000 square feet of just complete interactive fun. My girls love the Kid&apos;s Eye View section where they play in the construction zone, kid-sized house, market, farm, birds nest, etc. I just want to figure out when is the LEAST busy time to go because when it is overrun with kids it is hard to have fun. I know the staff tries hard but it&apos;s almost impossible to keep toys in the right section, have turns for everything when there are so many kids. If anyone knows the secret of when it is less busy let me know. So on busy days we go a bit faster through the Kid&apos;s Eye View and go onto MY favorite part the Story Factory, Media Zone, The Studio and The Terrace. I find that I always pull one kid to go to the Story Factory with me so we can put together story cards, make up sound effects for a story and write a comic strip. Then my husband pulls the other kid over to The Studio to make things with paper and put them in the "air tube" to see who engineered the best flying creation. The Terrace is fun because you can go out there and sit in a real life helicopter! They also have other exhibits that go in and out of the museum, we loved when the Sesame Street one came to town. Sometimes I am disappointed because when I go in with the kids they are "in-between" exhibits. Overall even when it is super busy we have a lot of fun here but don&apos;t forget to go upstairs to the other exhibits, personally, I think those are better and a bit less crazy. 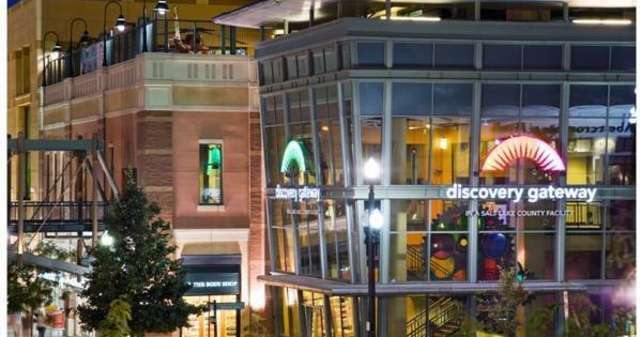 Discovery Gateway is located at 444 West 100 South in The Gateway in downtown Salt Lake. Vanessa blogs about what she and her family does in her Salt Lake City at INeverGrewUp.net and reviews things to do in the area on the Utah Review Site facebook.com/sassyscoops.